Video Insight stores all camera-related settings in a Microsoft SQL Server database. In multi-server configurations, a single database can be used to store all settings. Video Insight uses a Microsoft SQL Server database to store system settings, user permissions, activity, alarm, and system logs. Video Insight supports distributed and centralized deployments. With increases in bandwidth, switching, and better compression, it's now possible to move the servers to a central data centre. The Video Insight Server supports Automated Failover at no additional software cost. When utilizing the Video Insight Single Database configuration, a physical or virtual server can be designated as a Failover. 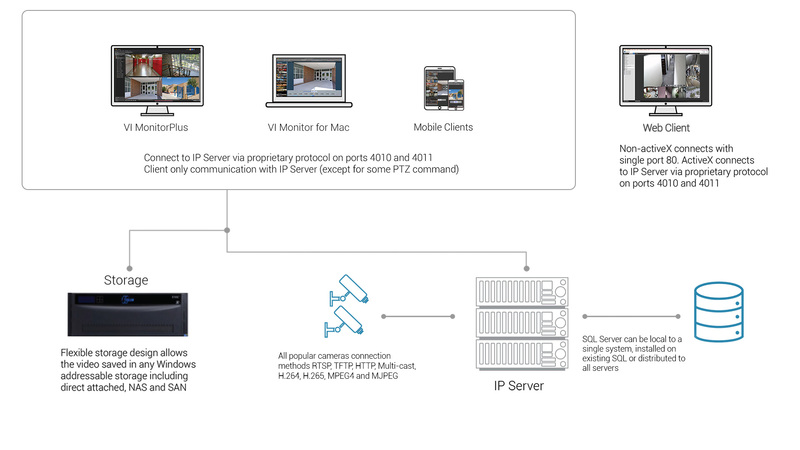 Video Insight IP Server runs as a Windows Service on 32 or 64 bit OS. Requesting images from the cameras, the IP Server processes the images for motion alarm, stores the video in a folder structure, and saves all configuration, motion, and system logs in a SQL server database. The Clients connect to the IP Server - not directly to the cameras - and the Web Client uses Microsoft Internet Information Server (IIS). From an architecture perspective, Video Insight has four components: Server; Storage; SQL and IIS - each of which can be configured a number of ways to adapt to your organization's needs.